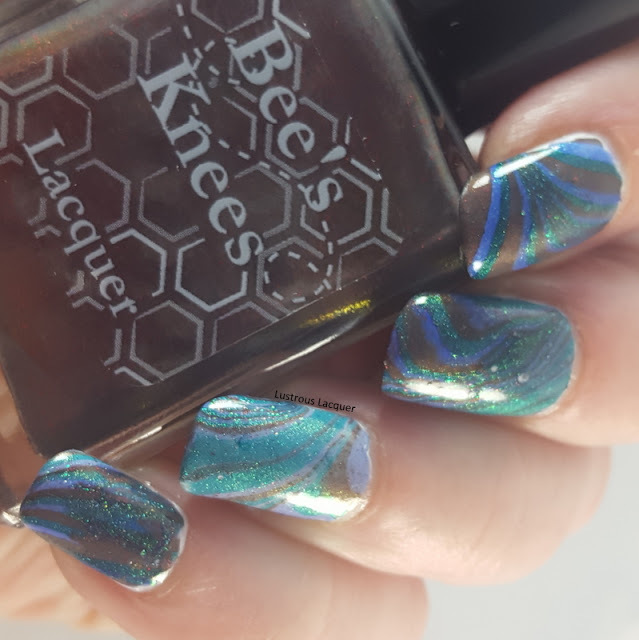 Hey everyone, I've got a quick post to share with you today featuring a watermarble I did with a few polishes from Bee's Knees Lacquer. You might remember I recently reviewed Which Witch Trial? and I'll be using that polish again in today's look. 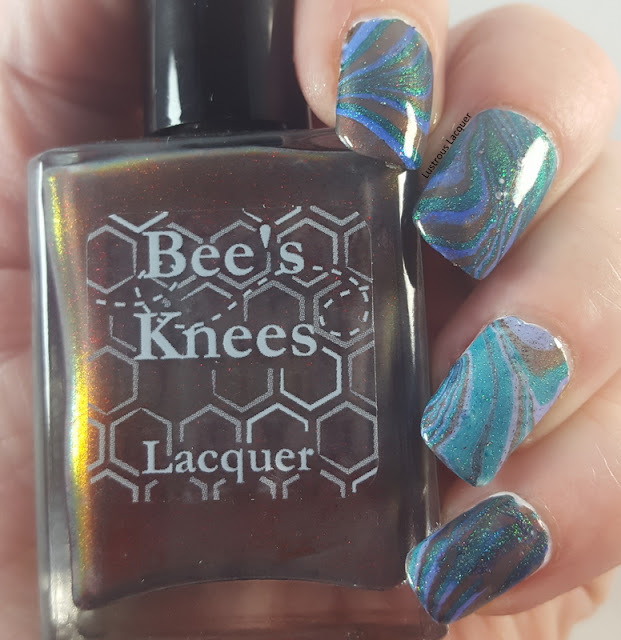 Last November my daughter was playing around making watermarble designs and I'd just received my order of Bee's Knees polishes. Yes, you read that right, I originally did this look in November and am just now getting around to sharing it. 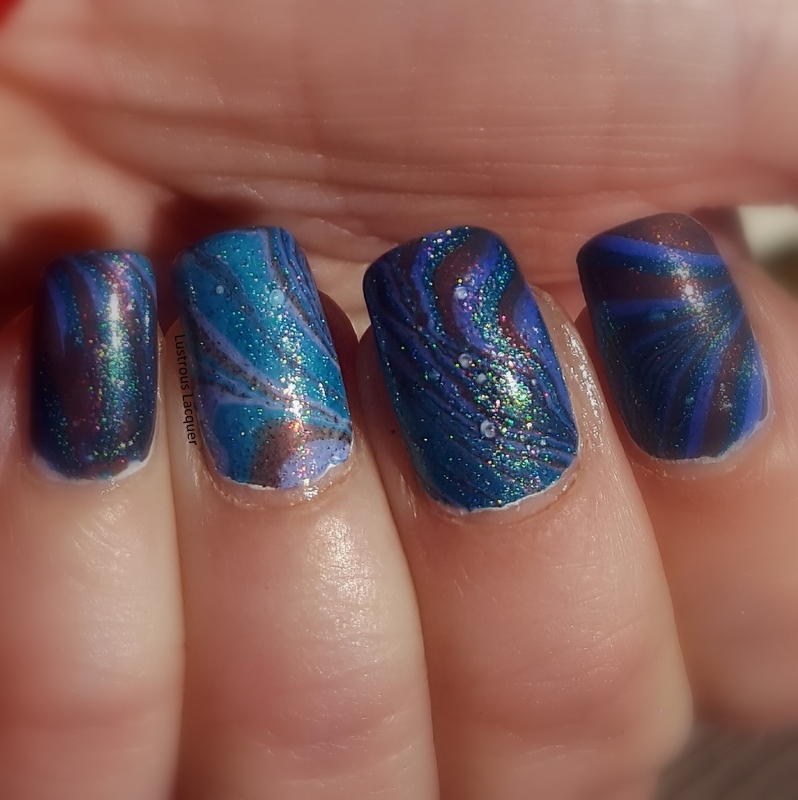 Anyway, after she was finished creating her designs I decided to see if my new polishes would work in a watermarble this is the results. I used the Illuminating base coat from Sinful Colors as my base and Bee's Knees polishes in Which Witch Trial?, House on Haunted Chill and Salty Anon for the design. Because I was just playing around I dipped all 4 fingers in at once which caused the design to get a little messy and filled with bubbles, but I still like the results. By the way, I wouldn't recommend dipping all 4 fingers at once. It did save a little time but not enough to sacrifice the finished look. What do you think of the end results? That's all I've got to share today, now I need to go finish packing for my first trip to Las Vegas. We are flying out this weekend for a friends wedding and I can't wait! WHich reminds me I'll still be in Vegas when my post goes live on Tuesday. I won't be able to do much sharing of that post because that's the wedding day but I'd love it if you all came back for that and if you like what you see give it a share. You can share it easily by using the buttons located all the way down at the very bottom of my post. I've got one last bonus shot to share with you before I go. This one was taken in the sun and really shows off all the sparkle. Thanks for stopping by and Happy Polishing!